Serena Williams of the U.S. returns a shot against Germany's Julia Georges during their third round match of the French Open tennis tournament at the Roland Garros stadium in Paris, France, Saturday, June 2, 2018. She pulled out of the tournament Monday, citing an inability to serve due to a muscle problem. Serena Williams called off her Grand Slam comeback because of a chest muscle injury on Monday, pulling out of the French Open shortly before she was supposed to play Maria Sharapova in the fourth round. 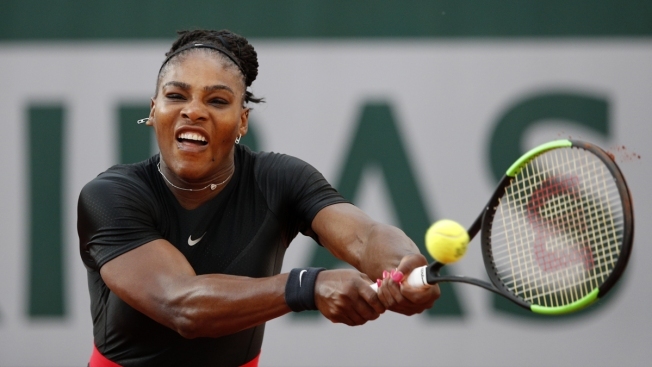 "It's extremely disappointing," Williams said during a news conference at Roland Garros. "But also, I made a promise to myself and to my coach and to my team that if I'm not at least 60 percent or 50 percent, then I probably shouldn't play." Williams, who has won 23 Grand Slam singles titles, said she can't hit serves because of a problem with her right pectoral muscle. Her voice trembled a bit as she explained that she will get an MRI exam and consult with doctors before figuring out what will happen next for her. "The fact that I physically can't serve at all is a good indication that maybe I should just go back to the drawing board and stay positive," Williams said, "and try to get better and not get it to a point where it could be a lot worse." The 36-year-old American was competing at a major tournament for the first time in 16 months — and for the first time since giving birth to her daughter last September. Sharapova wished Williams a speedy recovery and a rapid return to the tour in a two-sentence statement released by French Open organizers. "I was looking forward to my match against Serena and am disappointed that she had to withdraw," Sharapova said. "It was really painful," Williams said, "and I didn't know what it was." Despite that, Williams played in a doubles loss alongside her older sister, Venus, on Sunday and tried to limit the pain by taping up the muscle. But nothing was effective enough that Williams thought she could continue in Paris. Sharapova's coach said the Russian player was waiting courtside when they were informed of Williams' withdrawal. "It was a shock," Thomas Hogstedt said. "We were ready. We prepared a long time for this match." Their match had shaped up as the most-anticipated of the women's tournament, even though Williams has won 19 of 21 previous head-to-head encounters, including the past 18 in a row. AP Sports Writer John Leicester contributed to this report.